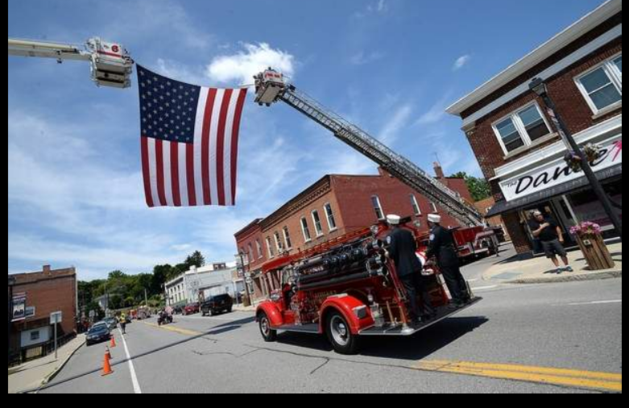 THE HISTORY OF THE ATTICA FIRE DEPARTMENT INC. 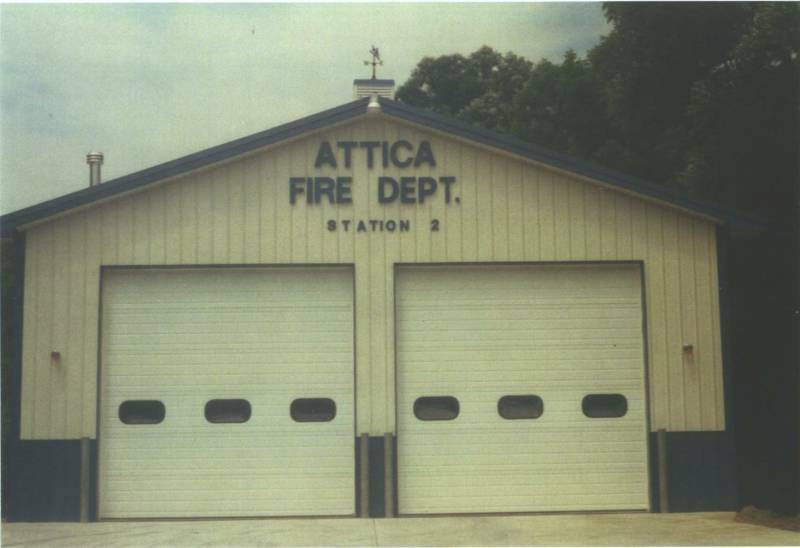 The Village of Attica was incorporated in 1837 with the first mention of a fire department by the Village Board in 1866. The Board decided to organize a Bucket & Ladder Fire Co. for the Village. The ladders will be placed on the bridge and the buckets will be taken care of by the Chief and his Assistants. Who these men were and what happened to the Fire Company is lost in time as there is no trace to their progress or any references can be found. The next mention of a Fire Department came in June of 1877 were the Village Board decided to investigate the purchase of fire fighting equipment. At the August 28, 1877 Board meeting, it was voted to spend $750.00 to purchase fire equipment.It was at this time, Andrew G KRAUSS began to organize a community effort to form a Fire Department for the community. On September 13, 1877 the WYOMING HOOK & LADDER CO.#1 was organized.The charter membership was 25 men. Harry HALL was the first elected foreman and Lewis BENEDICT the first elected President of the Company. Their carriage house and parlors were located at Main & Water Sts. 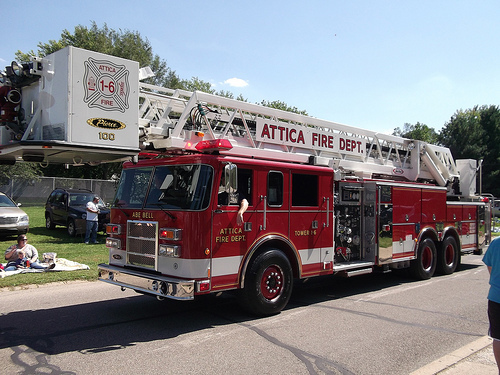 Sometime between when it was formed to when it disbanded in May of 1923, the name was changed to ATTICA HOOK & LADDER CO,#1. 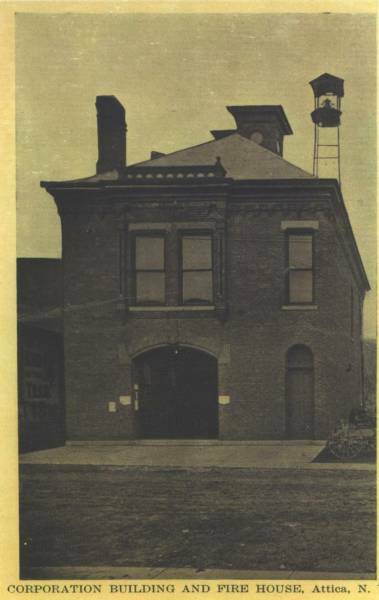 The RESCUE ENGINE CO. #1 was organized on March 6, 1878. It was with this group at Andrew KRAUSS joined. In the late 1870' s or early 1880's this group purchased a new engine for $600 from the RUMSEY Fire Equipment Co. of Seneca Falls NY. This hand pumper "PRIDE OF ATTICA" is still owned by the Attica Fire Department. Their engine house was on Water St were the present day firehall is. During the Spring of 1904 the charter for the RESCUE ENGINE CO. #1 expired and its members feeling no need for an engine company did not renew it. 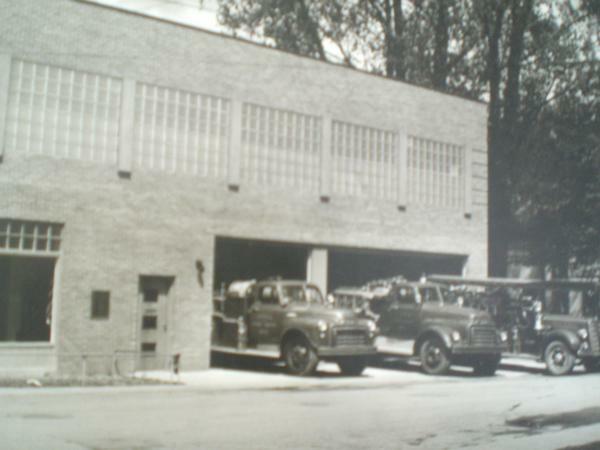 On April 20, 1904 the men then formed the MAPLEWOOD HOSE CO #1. On July 26, 1878 organized as an independent volunteer fire company, WYOMING HOSE CO. #1 was formed. This group had their parlors on Market St. 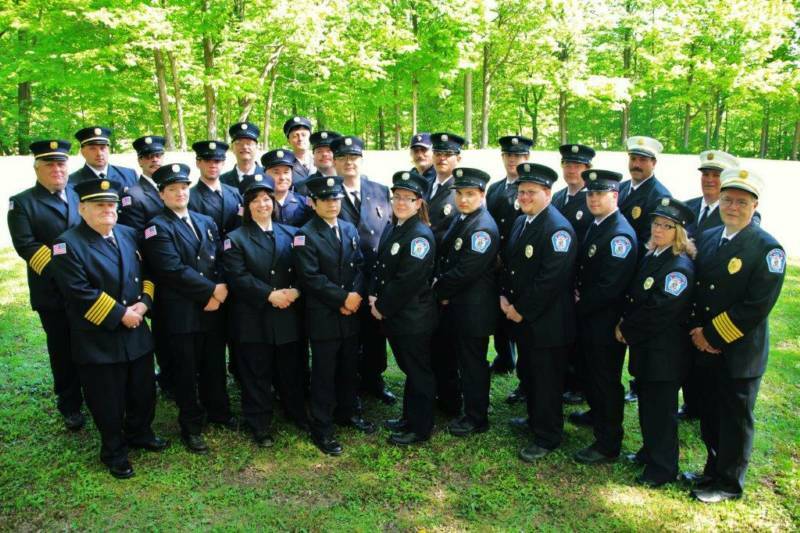 This group also was a fully uniformed group fitted in elegant style equal to any outside of the large cities.Their equipment consisted of 900 ft. of hose and a hose cart that was purchased from the COLIMBIA HOSE CO. # XI of Buffalo NY. This hose cart was built in North Buffalo in May or June of 1868 and is still owned by the Attica Fire Department. The three companies operated independent of each other, but were all members of theATTICA FIRE BOARD. In 1922 the 3 compinies decided to combine their knowledge and skills of fire fighting. 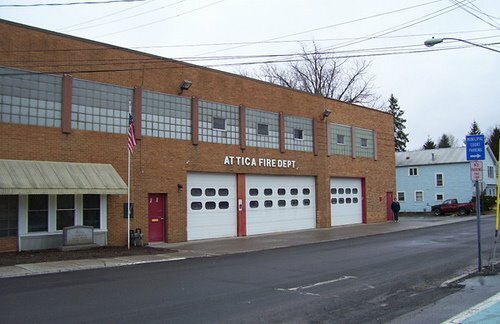 On April 12, 1923 a charter was granted to for the ATTICA FIRE DEPARTMENT INC, and such is still in existence today. FIRE HALLS OF ATTICA As the Village grew in size, there became a need for a central office for the Village to operate from. Many of the village residents had powerful political influence inAlbany , and used it well in getting State funds for a Village Municipal Building. The building will house the Village office, Fire Department, Jail, and have meeting rooms.It was built in the mid 1800's on the west side of Water St. were the firehall now stands.As time went on, major renovations were needed for the old building and more space was also needed. The Village bought the Barnes Blacksmith Shop just to the north of the Village Hall and in the spring of 1953 a new municipal building was started. On February 28, 1954 the new building was dedicated. The building stayed the same until 1967 whenan addition as added to the north side. The addition has a large meeting room on the second floor and fire truck bay on the ground floor. In 1977 a wall on the ground floor was removed between the truck bays and FD meeting room to give more room for added fire fighting equipment. The next major firehall event came in January of 1996, when the building of station 2 was started. The village had a small piece of land on Main St near Georges Dr that the Fire Department was able to purchase. The building is 36' X 40". The building has 2 14' doors and will be deep enough to house a ladder truck if needed. This building cost around $ 80,000. *** ATTICA FIREFIGHTER DIES IN THE LINE OF DUTY FOR HIS COMMUNITY ***** On a cold winter night of February 16,1922 , just before 10:00pm a fire was discovered in the basement of the Attica School on Prospect St. were the Elementary School now stands. The school was built in 1850 with additions in 1872 and 1874. As the alarm was being sounded, the School board President and another used a hose line in the front hall to extinguish the fire. The basement was carefully examined were it was found the ceiling around a vent shaft was charred as if burning for some time, the fire had escaped to the attic area and soon the building was doomed. 2 young fireman had climbed to the roof and were starting down the long extension ladder when it broke. Both fell to the frozen ground.Arthur UNDERWOOD was halfway down the ladder and Milton MEISNER was at the very top of the ladder when it broke. MEISNER was rushed to a Batavia Hospital were he died at the age of 21. He was buried with honors in Forest Hill Cemetery. In the long history of organized firefighting from 1866 to the present , only 1 member has died in the line of duty.